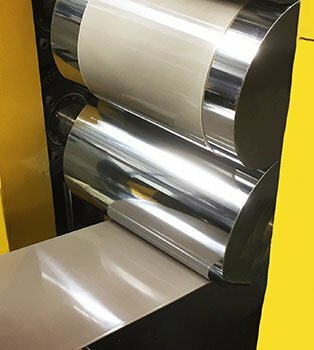 Film Calandering is a specialty process where molten polymer is extruded under heat and pressure onto a series of metallic pressure rollers to produce smooth, high-quality thin film. These rollers can consist of various materials and are heated and cooled to produce optimal film quality depending on which polymer is being converted to film. PEEK is the high-performance polymer of choice for film calandering due to its high molecular weight and melt strength (in much the same way as for the production of stock shapes). Once high-performance polymers like PEEK are calandered into thin films, the resulting film can be precision cut, stripped, or stamped to produce versatile and intricate components for various medical technologies. Some application areas are in the cardiovascular markets where very small and sensitive components are utilized in devices designed to help the cardiovascular system to remain effective with the heart pumping blood throughout the body. The process of film calandering high-performance polymers is not widely utilized and is only recently seeing increasing demand in the medical and life sciences markets. It is a very good example of the Drake Medical Plastics solutions orientation. Recently a start-up device manufacturer reached out to DMP with a need for 0.039-inch PEEK film to be used in a medical device for a novel and far less invasive heart procedure. Although at the time Drake did not have direct experience with film calandering, we acquired the proper equipment and were able to develop a solution and provide 0.039-inch PEEK film for this customer. Our current capabilities can produce PEEK film as thin as 0.005 inch.